BlogDo You Know Where The 2013 Jamboree Is? And now, we want to set the record straight on exactly where you will be when you come to the Summit Bechtel Reserve for the 2013 National Scout Jamboree. Welcome to West Virginia! The southernmost northern state, and the northernmost southern state. Admission to statehood: June 20, 1863. To be more specific, your new Scouting home is nestled in Fayette County, the heart of the Mountain State. And we’re neighbors to 70,000 acres of the famous the New River Gorge. If you didn’t know, this is home to some of the best whitewater rafting, hiking, biking and rock climbing in the United States. WV has a mean altitude of 1,500 feet, giving it the highest average altitude east of the Mississippi. Bring your walking shoes. The New River Gorge Bridge, in Fayetteville, (literally, your backyard) is the longest steel-arch bridge in the U.S., spanning 1,815 feet across the New River Canyon. Check out our post on Bridge Day! 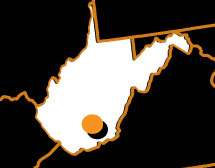 Have you visited the Mountain State before?